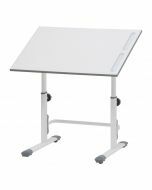 Kidsaw Kudl City Smart L highchair in white and grey is height-adjustable in three steps and fits Simple M1 children's desk. Rounded corners are for safety and prevent injuries. Dimensions H.75 x W.38 x D.46cm. 3 Different seat base heights (height from ground), 38cm, 43cm, 46cm. Can take up to 80kg of weight. To be used by 6 to 17 year olds. Simple, modern construction and a neutral colour scheme to fit in any room.